very cool indeed. This will bring Domino development a huge step forward. A class browser is included in the LS editor? And is it possible to push the source code to a CVS or SVN repository? Looking good! Thanks for posting. yes, a class browser is most definitely in the works. You can see it on the right hand side of the LS editor picture. 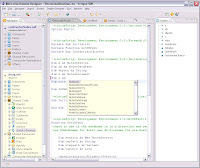 Eclipse natively supports CVS, and we are also looking at leveraging that. Some data may need to be binary to avoid losing data (after all, if source control lost information, it wouldn't exactly be control!) But yes, this is also on our radar. Very nice. Great in fact. Thank you for sharing it. You mentioned CVS .. are you thinking about this for just script or all design elements? hi scott - yes, I am thinking about source control for all design elements. Some will of course be easier than others. Until DXL can round trip without losing a bit, I won't use it for source control, but we could use a binary form at least until it was ready. Thank you Maureen for the screenshots, am quite excited to try out Notes and Domino 8 - we are still on 6.5!